I nominate Pert's Playing the Ragozin published by Quality Chess. My copy of the Repertoire says 2016. However, "The Complete Ragozin" by Matthieu Cornette is published 2017. Cornette' book is really impressive. Not the best layout ever (sadly, because the material is excellent) but a very great piece of work. I nominate 'Dismantling the Sicilian' (2017 edition) by GMs Jesus de la Villa and Max Illingworth. It will be my vote when the poll comes up. 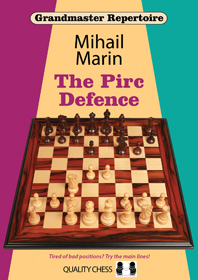 Grandmeister Repertoire: Pirc Defence by Marin undoubtedly, is my choice. I'll nominate Bologan's King's Indian (2017) from New in Chess. I understand the material has evolved from Chess Stars (2009) and ChessBase (2016). A cynical reviewer has even called the material 'recycled', but this is the book I've used the most from 2017. Thanks guys, for getting the ball rolling without me! If you need help setting up the poll, let me know. If we already included it in last year's voting, I don't think that we should include it this year. Oh, I didn´t notice it was already in last years poll. Then, of course, I agree. I'd like to nominate Vincent Moret's My first chess opening repertoire for black. I appreciate it isnt everybody's cup of tea in regards to the openings it chooses - Gambit lines of the scandinavian, Albin and stonewall, but i think it does what it aims to do in presenting the material in a very reader friendly way and so anyone studying this book could pick up those openings quite quickly. As much as i love Smerdon's book, i found it somewhat easier to understand Moret's presentation perhaps precisely because it starts the introductions to the openings with the 'ideal' set up and attacking themes, has fewer variations in each line and also includes sections for testing the thematic moves at the end of each chapter to aid pattern recognition. I also think the lines it presents are covered in a much more thorough way than in his first book that covered playing with the white pieces. Its definitely a style of presentation i would love to see replicated. That's typically why we wait until later to start the nomination process--to give books published at the end of the year a chance to get into readers' hands. We probably jumped the gun this year. If we started looking for nominations earlier than usual this year, I suggest we just leave the nominations open for longer - until the end of February, perhaps? Or whatever has been the normal timeframe. Well, Pert´s book was published 21 December 2016, so it´s likely that most people read it in 2017. Therefore I think the nomination of the book should be allowed. I checked my copy and of course you guys are correct. I blame Google Books, which says that it was originally published March 7, 2017! I'll second this book nomination. Decent lines, fairly good analysis and nice explanations. Hard subject to write repertoire book on as well. To be fair, also a lot of move order issues and lines that are not regarded, to that day. I'd like to nominate "King's Indian Warfare" by Smirin. It contains the most fantastic chess i have seen for a lot of years from a true specialist of the opening. An opening guide as well as a guide to dynamic chess in general. Not sure it will give competition to Ntirlis, but I enjoyed it a lot. The explanations were good, interesting choices and the depth of theory about right for me. From other books not yet nominated I also liked the Nimzo Indian book by Roiz. However I don't use it much, as I prefer the choices Gustafsson made in his Nimzo video series on chess24. I'd like to nominate Kiril Georgiev's "Fighting the London system" (Chess Stars). Although I don't expect him to win, I consider this an excellent effort, as the author tries to give practical solutions to a very common OTB problem, and I like the progressive approach of chess stars books compared to the heavy analysis of QC works. K.Georgiev gives good explanations and pointers as well. belong on the list of candidates. I have not purchased any books in 2017, so may have to abstain this time. I second Ntirlis's "Playing 1.d4 d5." It has great explanations of otherwise-untreated pawn structures, cutting-edge theory, and coverage of topics beyond those required. Last year I believe the problem was that the Poll was mistakenly open for Guests as well. I don't think too many people would create an account to vote for their friend, but when you don't even have to do that but can just click, naturally it is going to happen. We always vote on opening books only. I would request that this year we limit voting to contributing members in some way. We don't have to have stringent requirements: ten lifetime posts, something like that? But it would be nice if the award actually reflects the members of our community and not a social media effort. My personal vote would go to Ntirlis' "Playing 1.d4 d5. A Classical repertoire for Black". I wonder, does it have to be an opening book?